Summer is finally here and I’m starting to play around with some ideas. 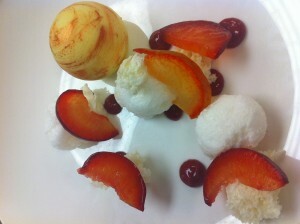 Here is one I came up with this week inspired by floating island dessert. Its a plum focused dessert with a rosewater poached meringue, white sponge, and parmesan cream. The parmesan cream is encapsulated inside the ball of white chocolate and the customer breaks the ball to allow to cream to flow out.